Quite often, modern seniors return to the dating scene after a long break – most of them got married in their 20s or 30s and were living with their constant partners for many years. Divorce isn’t a rare thing nowadays so senior dating becomes more and more popular with time. Becoming a dater again in your 40s or 50s is not so easy; there is nothing odd about it. The rules of wooing have changed since you were younger and you should somehow adjust your mind to all this mess. Let’s now see what to do about it! Is splendid dating after 40 really possible? In contrast to dated beliefs, people who are older than 40 nowadays tend to lead active lives. They wish to enjoy love and romance and the age-factor is a minor argument used by those who think there can no passion between senior mates. Most of us become wiser with age. Since you have been through unsuccessful relationships and various difficulties related to those, you can choose now the right lover for you. Online dating for seniors helps you contact multiple relationship materials at the same time and avoid wasting your time on incompatible users. Indeed, you don’t need to play games anymore – you want to only enhance your romantic life. By using free online dating for over 50s or 40s, you become able to learn somebody’s soul without going out with this person, which protects you from unpleasant surprises live dates might bring. This saves you lots of energy you can spend on more important connections. Another great thing about dating in your mature years is that your romance will likely be free of obligations. You probably know the taste of family life and have an established career; these things make you aware of your strengths and flaws. You do not need a woman or a man who would encourage you to grow. Well, this is true if you date someone of your age since dating with younger mates is usually trickier. See our recommendations on how to make your dating life minimally troublesome now! 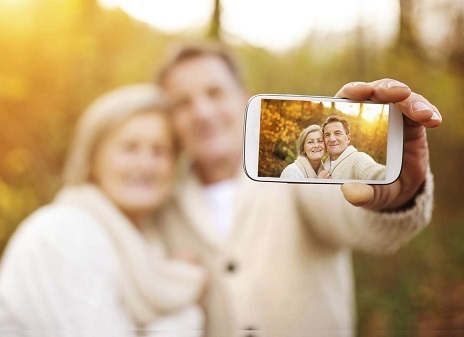 10 Online dating tips for seniors: make it count! #1 Do open your mind to new things. The older we get, the more conservative we become – it is a proved law of life. Dating in your 50s, for example, is gonna be completely different from what you were used to 20 years ago. So the very first thing to do about it is to step out of your comfort zone. You will have to deal with new technologies, new flirting techniques and new conceptions. This all will impact your success! Sure, you need to study this unexplored field prior to starting your searches of a perfect match. #2 Do use all possible opportunities. You don’t have to look for a potential romantic partner at singles parties only, nor have you to choose someone of your own age. If you would like to meet a decent woman/man from abroad or date a younger person, you are free to test your luck! Go to dating sites for seniors or international dating services and see the big picture. #3 Do present your strongest sides. As a senior, you have many undeniable advantages that make you a relationship material. First, you are likely a fully-grown person and know your worth. Second, you are completely independent and can excite potential matches with your accomplishments and experience Avoid being modest when it comes to facilitating your love life! #4 Do add great photos on your dating profile. Cyber dating now is probably the fastest way to find people for relationships. If you are completely new to it, I suggest that you look for the best senior dating sites and see how the most popular members present themselves. One of the biggest mistakes of older daters is that they often forget to upload pictures on their profiles. But this just decreases your chances of success. #5 Do go out with different people. Modern people can choose partners by just signing up for the right online dating resource. So it would be wrong to go out with a first available match and restrict your search. The best strategy is to communicate with more people before you actually arrange the first in-person meeting because you will get to know all the attractive candidates and drop those who are not right for you. #6 Don’t share false information in order to attract more partners. Many senior daters feel uncertain about their attractiveness because they are already not so blooming and adventurous as 20-something users of online dating sites. Men and women at the age of 40+ pretend to be younger than they are – allegedly, this helps them pick up hot young lovers. However, I must warn you that lies are never good for your image. Why not just be yourself? #7 Don’t look for matches of a particular age only. Since most senior daters have been through committed relationships with their age mates, they now want to experience dating with youngsters. Indeed, youth will always be alluring. Yet there is the huge risk of getting disappointed with the outcome because May-September love hides many pitfalls. #8 Don’t struggle to be a bad girl/boy. This is another mistake many 40-something daters make in order to impress their prospective partners. You might think this is a very cool way to appear youthful but others perceive it as buffoonery. Surely, you possess many valuable qualities that make you stand out – so use your charisma instead! #9 Don’t underestimate yourself. On the other hand, you can become a desirable relationship material for younger women and men because you have what to give to them e.g. your wisdom, your ability to manage couple conflicts, your sense of what really matters in life and your broad-mindedness. If you feel you are capable of dating young people, keep searching for someone to love. #10 Don’t get desperate if something goes wrong. Due to the hustle and bustle of modern life, it becomes rather problematic to meet a compatible person to date. We are all humans; we do make mistakes. Not to mention that the Internet toady is full of weirdoes. I advise you to take it all as part of your big adventure – the most valuable here is to get experience, after all. Remain physically attractive. Irrespectively of matches of what age you wish to make fall for you, this is the key to success – first of all, we estimate people with our eyes and only then with our heart. Live your eventful life. No matter how old are you, there are always things to learn, places to see and activities to do. Love searches shouldn’t be the main part of your life. Yet if your every day is meaningful, others start getting excited about who you are. State your relationship goal. Dating in your 50s is somewhat easier than dating in your 20s because you likely do have your vision of a perfect partner. However, you need to figure out why exactly you look for a new lover and how far you are ready to go. Learn from mistakes you make. Yes, you have knowledge life and relationships. But it doesn’t mean you are absolutely safe from taking ill-advised steps. Keep accruing your experience in online dating and your further tries will be smoother! Protect yourself from scams! Free senior dating sites aren’t scams themselves but there are some people who come there with evil intentions. Study the rules of how to protect yourself before creating your account.